A timber-frame structure is deconstructed and rebuilt into a remarkable residence 200 feet from the Missouri River an hour west of St. Louis. Whatever you do, don’t call Tom and Tricia Reay’s inspiring post-and-beam river residence a log cabin – “It’s a house,” says Tom of the 45-by-50-foot barn he and his wife deconstructed, then rebuilt on a vacant three-acre plot just 200 feet from a meandering bend in the mighty Missouri River. But the Reays are experts when it comes to unearthing remarkable pieces with unremarkable price tags. 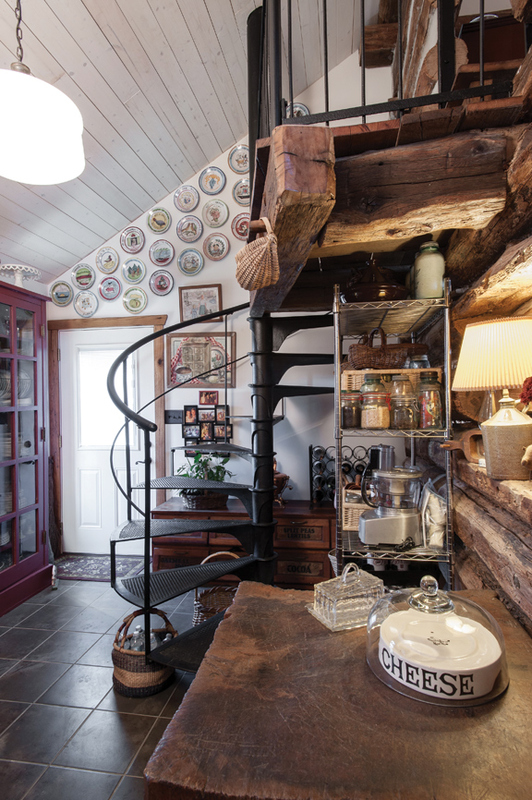 Take the circular staircase, for example, a cast iron monstrosity extracted from a 100-year-old firehouse in Minnesota, purchased from a contractor in the Lake of the Ozarks for $400. 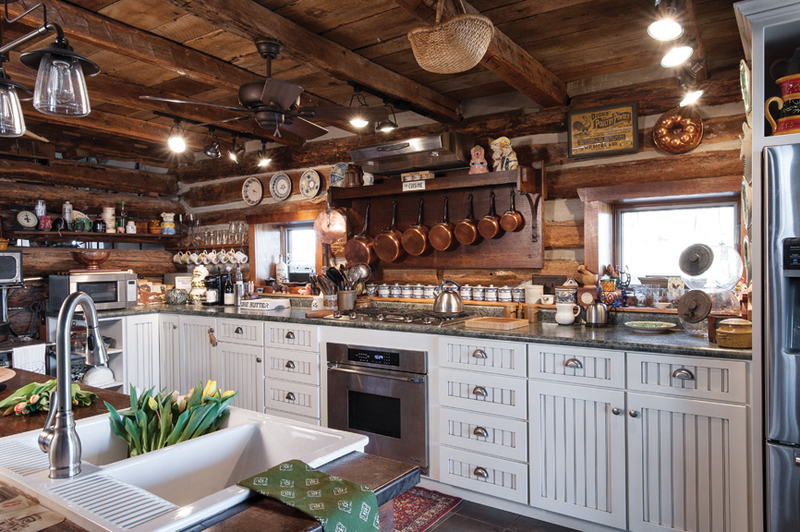 The kitchen island, too, which holds a Parisian white porcelain farmhouse sink, was originally a solid-walnut countertop at a drugstore in Tennessee. “It was seven-feet-long and built around 1880,” says Tom. The couple found their island in an antique store in Southern Missouri and cut holes for the sink and a dishwasher, which, along with a nearby Dacor gas stovetop and electric oven, is one of the scant pieces of new material you’ll find. Even the floors – random plank oak from the original barn’s hayloft – are entirely reclaimed. The Reays wound up with an open layout: a conjoined kitchen, dining room and living room, as well as a first-floor master suite. Tucked high above the kitchen you will find a quaint guest bedroom, too. The couple added a walkout basement that will function as a wine cellar once completed. The home’s interiors are every bit as authentic as its construction materials. “We’ve just collected things along the way,” says Tricia of the wonderfully eclectic décor. The two glass cabinets in the pantry, for example, which Tricia uses to store her vast dish collection, were once book cabinets in an 1800-era St. Louis schoolhouse that was torn down a few years ago. The pieces integrate flawlessly with an old claw-foot tub and a Parlor’s wood-burning stove. That substantial living room chandelier, bronze with wood antlers, came from a contractor friend who was remodeling a home in Sonoma, CA. “They took it out of a $2 million house and mailed it to us,” Tricia recalls. It was Tricia who, since childhood, had dreamt of someday living in a wooden barn. And, as Tom watches hundreds of snow geese come in on the water, he too feels content in his reclaimed paradise.